Place all the ingredients for the meat mix in a bowl and mix really well with a wooden spoon. Shape into 12 small balls approximately 2.5cm (1in) in diameter. Put the meatballs in a large roasting tin drizzle with camelina oil and bake in the oven at 220oC for 7mins. Meanwhile make the sauce. In a saucepan or frying pan sweat down your onions in some camelina oil on a medium heat for 30seconds, now add the curry powder and tomato puree and cook out for another 30 seconds. Add the coconut milk, ginger, soya and salt and bring to the boil. Take the meatballs out of the oven and pour the sauce over them and place back into the oven for another 7mins. For the rice place all the ingredients into a pot with a lid and bring to the boil rapidly. Turn down the heat and allow to simmer for 8-10minutes until light and fluffy. Remember to remove the cardamom once cooked. They should sit at the top of the rice once cooked. For the garnish on a frying pan with some hot camelina oil, flatten little pancakes of grated potato and fry on a medium heat until golden and crispy on each side. 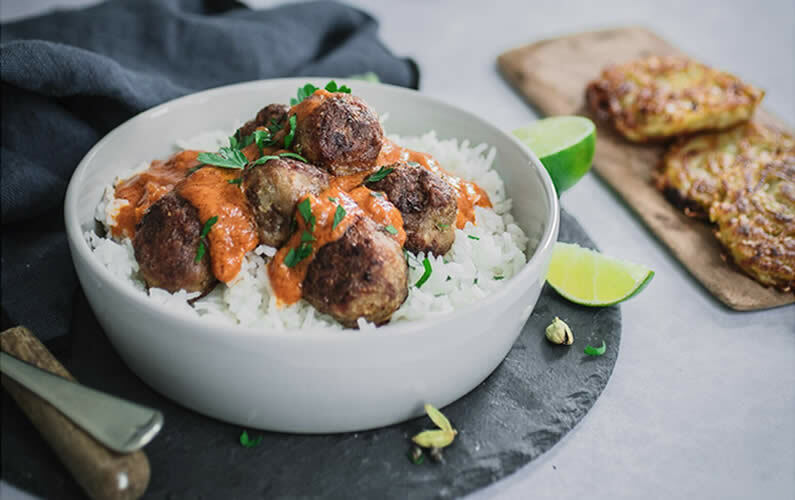 Serve on a decorative platter by spooning on the rice, then the meatballs, sauce, garnish and tuck in!